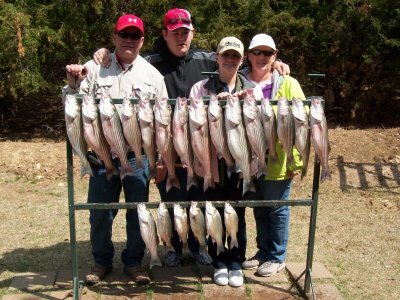 Although March was our typical early spring fishing with both good and not so good days, we are definately now seeing an improvement in our striper fishing on Lake Texoma as we head into mid April. Lake Texoma surface water temperature is 58 degrees with an elevation of 615.19. Live bait is working well in the shallow flats 10-25 feet of water while drifting. We have also caught some nice limits of stripers on anchor in water ranging from 40-50 feet deep. These past few days it has been steady, just finding and picking at them. As Lake Texoma water temperature continues to rise we will start to have some of the super fast striper action.